Imagine this scenario: You’re in a hotel room and you bring your iPhone, Macbook, External Hard Drive, Camera, and another iPod cause you’re nasty..but they’re all in need of a charge. You run and send a search team for the nearest available outlet, to your utter dismay it only provides two outputs. You reason you can live without a couple of those items but then you can’t fit two clunky chargers at once. You’re left with just charging one device. We’ve all run into hotel rooms that just don’t seem to have enough power outlets. 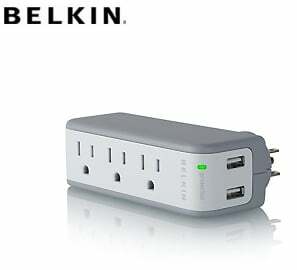 With the Belkin Mini Surge Protector with USB that problem is pretty much solved. How does it perform? 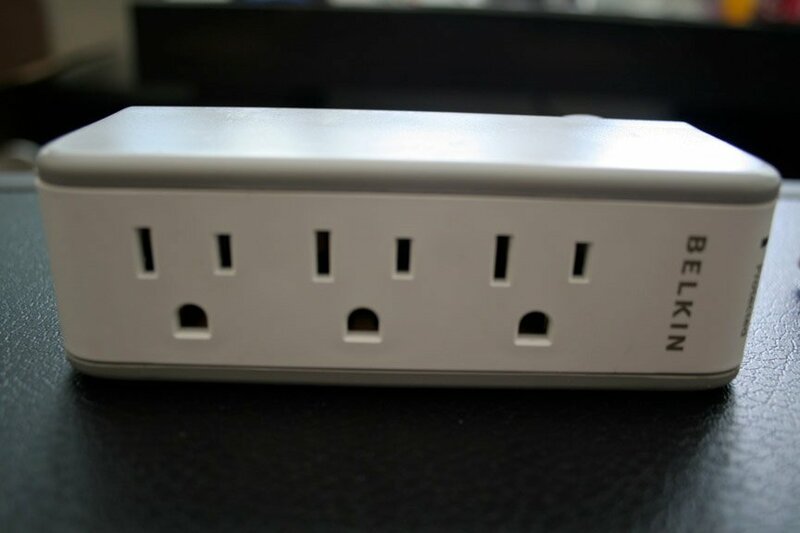 It’s a portable surge protector that includes 3 electrical outlets and 2 USB ports (for charge only). They also throw in a Mini-USB charger for you in the box. Obviously it won’t win any design awards but the white and grey look is clean and will match your white charging cables from Apple, if you’re into that kind of thing. 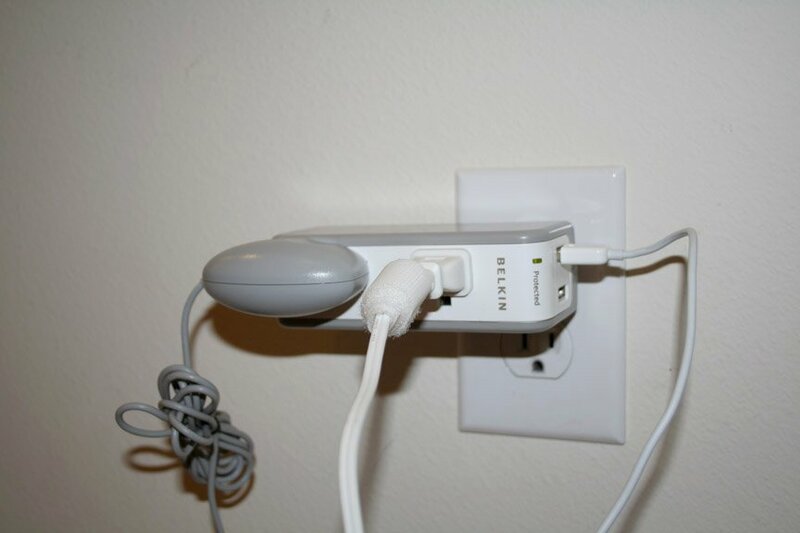 The uniqueness of this electrical solution is the ability to rotate the surge a full 360 degrees with four locking positions (up, down, left, right). 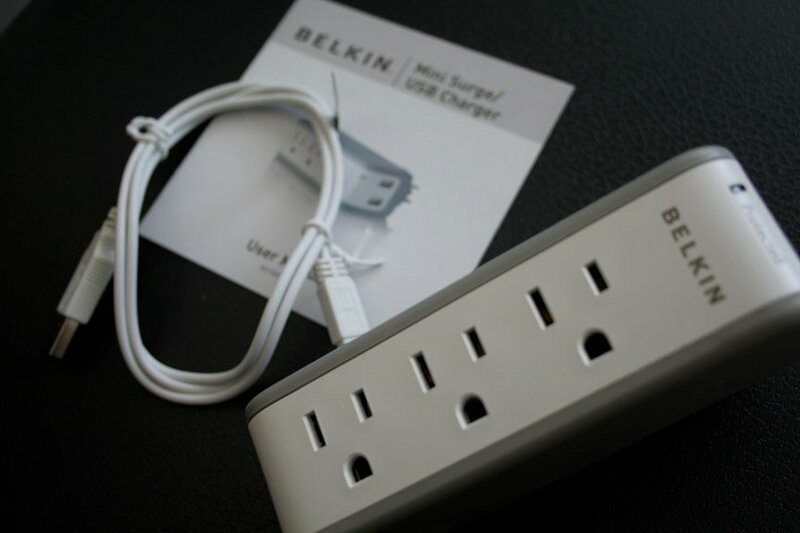 Meaning you can adjust the surge to your liking or to fit the surroundings of any outlet. It’s a bit taller than your iPhone and as thick as maybe 4 iPhones so it’s not exactly small but its size is certainly purposeful. Build quality is solid, it makes you feel safe just holding it. 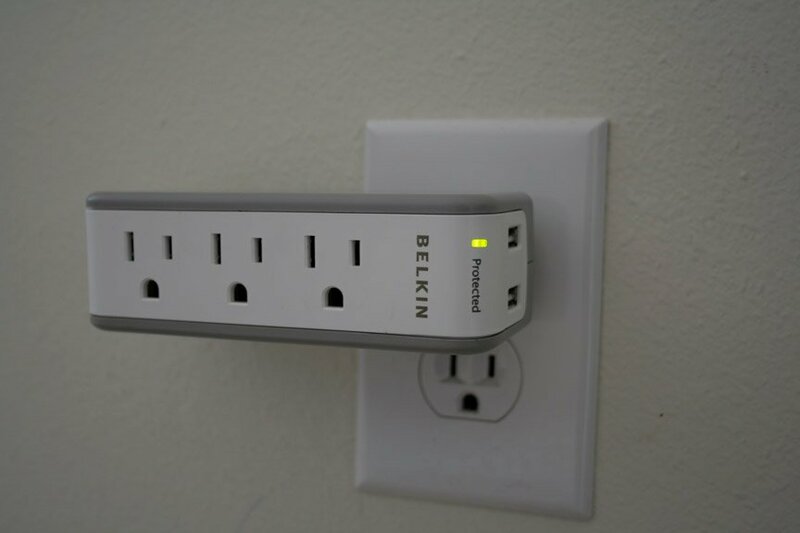 Belkin did a really good job in making this surge protector a sturdy, trustworthy device. But I won’t lie, for a surge protector, this may be as good as it gets for design. It even matches Apple’s minimalist products! What I take from all these numbers is that it’s okay to plug your devices in and certainly a lot easier than lugging around an actual surge and better than not having enough outlets to plug into. Also, Belkin promises a Lifetime Product Warranty and $75,000 Connected Equipment Warranty. Who knows how hard it is to actually file a claim but hey, at least they mentioned such policies. Though it isn’t the most compact device, it has become a must-add to my laptop bag. I’ve already found use for it at the local coffee shop, a hotel room, a classroom and expect to use it in more locations such as airport terminals and other public spaces. Honestly, I have no worries of being without a charge when I carry this portable surge around. Also, sharing the plugs with neighbors is fine by me, many suits breathe a sigh of relief when they see me pull out the mini surge protector. This item isn’t exactly perfect though. I do wish the 3 electrical outlets were spaced a little bit wider, with so many unwieldy chargers these days it was hard to use ALL 3 outlets at the same time. Also, I would have preferred to see the actual plug snap into the body of the surge, which would make this device even more portable. Luckily they toss in a cap to protect the prongs. This is probably the perfect solution for any road warrior or frequent traveler. It seems as if there just isn’t enough plugs in this world to plug your electronic goodies into. 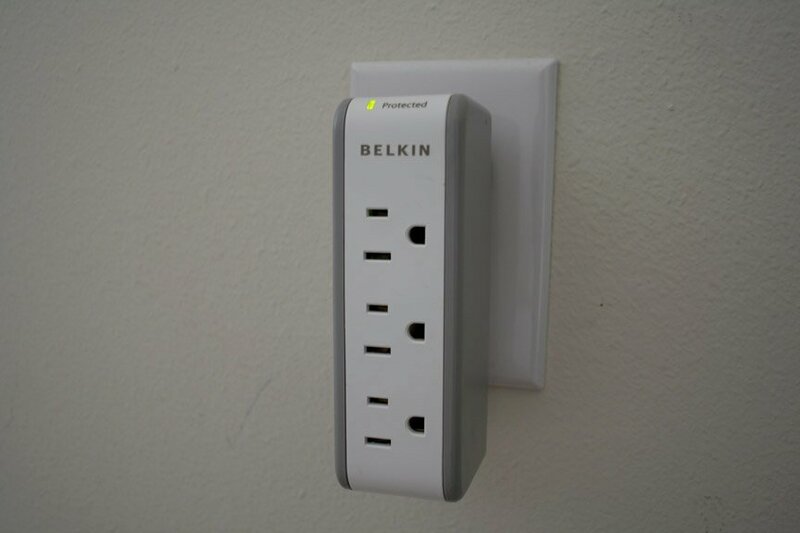 So until hotels revamp their whole electrical wiring and public spaces offer multiple outlets, the Belkin Mini Surge Protector is probably the best solution. A 5 for 1 portable solution? Not bad at all.